When pioneers got to their destination, there were no rentals or prefabbed houses. They had to make do with what they had and learn to create their own homes. Their first homes may have been their own covered wagons if need be! Discuss the following types of homes with your students and encourage them to compare the homes of the pioneer world to their own homes! Use the history worksheet included with this lesson plan to reinforce what your students have learned. One fun way to get students interested in pioneer homes is to ask them what their dream home is like. Following this discussion, ask students what they think most pioneers looked for in a dream home. They may very well be surprised by what they learn about pioneer homes after this discussion! Tepee, also spelled as “Tipi”. This type of home was usually made using canvas or hides. Pioneers would have used this home as a temporary domicile. The tepee is constructed by making a tripod of poles. Pioneers most likely used saplings for this. More poles were added as was needed. The poles were covered using hides or canvas. There was a smoke hole in the top of the tepee so that pioneers could have a fire inside the tepee and not be smothered by the smoke. It was not actually very common for pioneers to use this method of housing, but it was necessary from time to time. Lean-to. The lean-to built in its most extravagant form would look like a tent in the shape of a box. However, it was sometimes necessary to simply drape canvas over a tree limb and use smaller trees or branches to create some type of protection from the weather. The front of the lean-to acted as the door, remaining open during the day and closed at night to provide protection from the weather as the pioneers slept. Shanty. The shanty is a simple building that would remind people today of a medium sized shed. The shanty was no more than one room, built with materials to be found around the pioneers such as wood. If the shanty had a window, it may have been made of wax paper. Log cabin. This was a permanent type of home, built by the pioneers. The log cabin is made from wood that the pioneers cut down and fitted together. Often, to fill the spaces between the logs, pioneers would mix wheat or even prairie grass with mud and pack it between the logs. 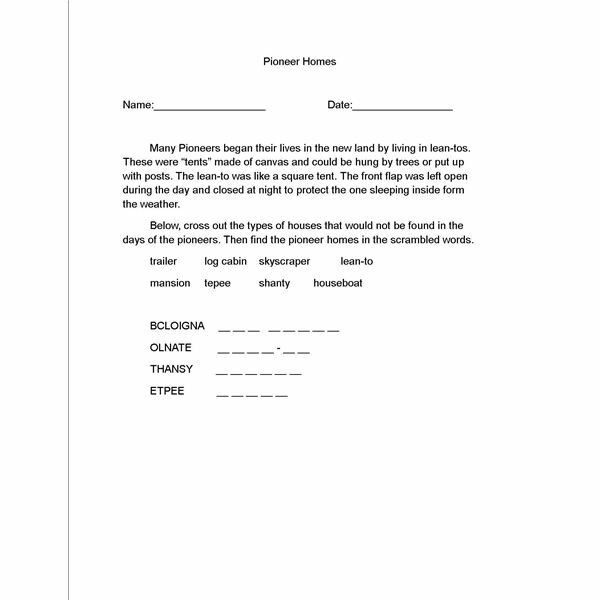 After explaining the various types of pioneer homes to your students, have them complete the included history worksheet. You might also have students build their own miniature pioneer homes as a creative activity to develop their interest.